When your parent or loved one passes away, you sometimes find out they changed their will shortly before they died. They left you out for no apparent reason, or worse, left their estate to someone they just met. Or, sometimes someone challenges a will even though everyone knows exactly why they were left out of it. Contesting, challenging or seeking to overturn a will is called a will contest. A will contest can also involve a related challenge to bequests made outside the will. For example, a trust can transfer assets on death. Life insurance policies, retirement accounts and bank accounts often have beneficiary designations that determine the disposition of those assets. Vehicles and real estate may be transferred to surviving joint owners or transfer-on-death designees listed on titles and deeds. These transfers can usually be challenged and upheld on the same grounds as a will contest. Did not sign the document or signed the document without the proper formalities — such as in front of the necessary witnesses or notary. Did not understand what was going on, lacked capacity to sign the document, or was mistaken or delusional about who the natural objects of their bounty were or should be. Was unduly influenced by a beneficiary to make the change or bequest. Important Note: The answers below apply only to will contests in Wisconsin — i.e. wills that are being or can be probated in Wisconsin. Will contests or wills probated in or controlling property in other states may have different rules and the answers below may not apply. Always consult a licensed lawyer to evaluate the facts of your individual situation before relying or acting upon anything in this website or the Internet. c. The decedent was unduly influenced to execute the will or make the bequests stated in the will. To pursue a will contest in Wisconsin, you must have “standing” – a fancy word requiring you to have a financial or other interest in the outcome of the will contest. Generally anyone named in the decedent’s current or former will and their intestate heirs have standing. This includes persons named as executor, trustee or beneficiary in a will and the decedent’s spouse, children, and sometimes their siblings, aunts and uncles, parents, and grand-children. The court can also grant standing to other people – like trust protectors, alternatively nominated personal representatives, ex-spouses or ex-relatives. See Wis. Stats. sec. 851.21. A will contest in Wisconsin can be started any time before a will is admitted by the court into probate. Caution: Property can be transferred on death other ways than by will and probate – for example, bank accounts often are distributed to named pay-on-death beneficiaries, life insurance policies pay directly to named beneficiaries, and trusts usually distribute money without court involvement. Anyone thinking about challenging a will or estate plan in general in Wisconsin is wise to act promptly. Generally, a will is admitted into probate in Wisconsin about 30 days after a petition is filed concerning the will, unless a written objection is filed. The exact date is set by the court. 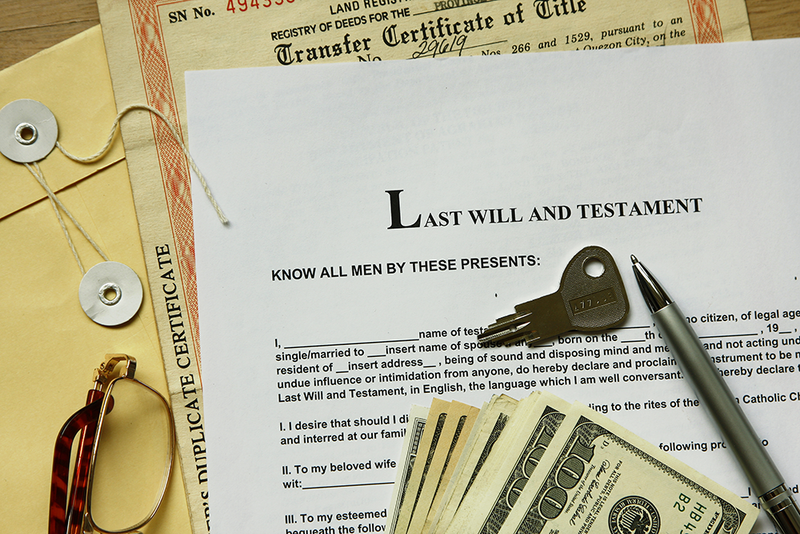 After the will is admitted into probate, it becomes more difficult to challenge the will. Caution: Wisconsin law requires that only certain people must receive notice by mail of the filing of a petition to admit a will into probate; everyone else gets notice by a general notice published in a local newspaper. Anyone thinking of contesting a will should act promptly after the decedent’s death and regularly check court records for deadlines set. Ullenberg Law Offices SC generally charges on an hourly basis for each lawyer and some staff members; ranging from $150 to $300 per hour. Sometimes, we can help clients on a contingency fee basis. Will contests are usually fact-specific to each person’s situation. Will contests often require custom-drafted petitions, discovery plans and requests, and various pre-trial motions. In addition, opposing parties and their lawyers often file motions, discovery requests, and other proceedings which require responses. As a result it is difficult to predict what discovery, motions, and responses will be needed in your will contest case. There is no minimum or maximum cost for a will contest; it all depends on the unique situation of each decedent and the parties involved in the will contest. However, in certain situations, some people who challenge a will may seek reimbursement of their attorney’s fees and costs from the estate. If you’re concerned about costs, let’s discuss what we can do that will bring you the results you want. While we cannot control how opposing parties will respond to a will contest, at Ullenberg Law Offices SC we are on your team and at all stages of a will contest we will give you a frank assessment of your case and what we think it may cost you to estimates of what we expect further proceedings to cost. Who pays to challenge a will? Wisconsin follows the American-rule that litigants pay their own attorney’s fees. However, in will contests, the court can order the estate to pay the reasonable attorney’s fees and costs of certain people who object to or defend a will. Generally the person must be a person named in a will denied probate and propounded in good faith. People who contest a will frivolously may be ordered to pay the opposing party’s reasonable attorney’s fees and costs. Note: Reimbursement of fees is not guaranteed. The judge must still agree to award those fees and there must be sufficient assets in the probate estate to pay the fees. A will contest is usually started by filing an objection to the proffered will, petition to set aside that will and probate an alternate will or distribute the estate according to intestate rules, and a claim for reimbursement of fees associated with the will contest. Interested parties are given written notice of the filing; and the probate court sets further deadlines and dates concerning discovery, pre-trial motions and trial. Because of the amounts usually involved in estates and the extensive rules about what documents must be used, what information they must contain, and how they must be served and filed, it is strongly recommended that you retain an experienced estate litigation lawyer to help you contest a will. Will contests are not a do-it-yourself project. The first step is to contact us. Tell us what has happened, and we’ll explain what can be done to address your situation. We have also helped our clients successfully defend their positions on appeal: Born v Born, 372 Wis.2d 458, 888 N.W.2d 247 (Ct. App. 2016). Whether you need help enforcing a will or trust, or trying to challenge a will or trust that was improperly executed or executed under suspicious circumstances, Ullenberg Law Offices SC can help. We know these will contest situations are stressful and disturbing especially since they usually arrive shortly after your loved one passes away. We have done it before, and we can help you navigate these situations. If you need to go to court, we will be there right at your side too.